Cold, creamy, and luscious, homemade ice cream recipes are a much-revered treat. While this dessert is readily available in the freezer cases of grocers and specialty stores, homemade ice cream is in a world of its own. When you make your own, you combine fresh, rich ingredients with the flavorings and add-ins of your choice for a delectable experience. Ice cream's origins can be traced to cold puddings and custards served in ancient Asia and the Persian gulf region. 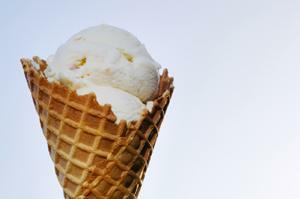 However, "modern" ice cream is generally believed to have originated in the 1600s in Europe. American Colonists brought the recipes with them and it has remained a favorite in the U.S. This frozen dessert is made from heavy cream, milk, sugar, and assorted flavorings; some ice cream recipes include eggs, which create a more custard-like ice cream base. However, the thing that really accounts for the sumptuous nature of ice cream is its texture; this is created by stirring or "churning" its mixture during the freezing process. As ice crystals are formed, the stirring process prevents them from growing too large; it also adds tiny bubbles to the cream, which are largely responsible for the pleasurable mouth-feel of the treat. Early home ice cream recipes used ice and rock salt to freeze the substance and a laborious hand-cranking process to stir; modern ice cream makers use electric freezers and motorized churning blades, taking most of the work out of making it and leaving all of the fun. Planning to make homemade ice cream? Try a basic recipe first, but then feel free to experiment with your own mix-ins. Or, add toppings to make sundaes that suit every taste.